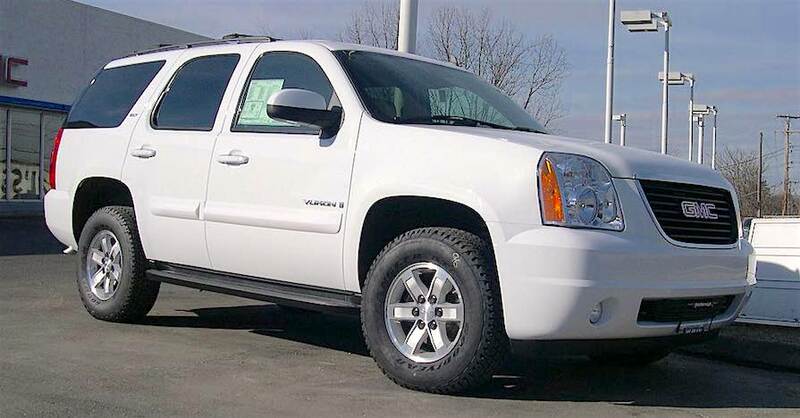 Nothing says horsepower like an engine compartment dressed with stainless steel braided hoses. Of course, nothing hurts like stabbing your fingers with the frayed edges of a braided hose. 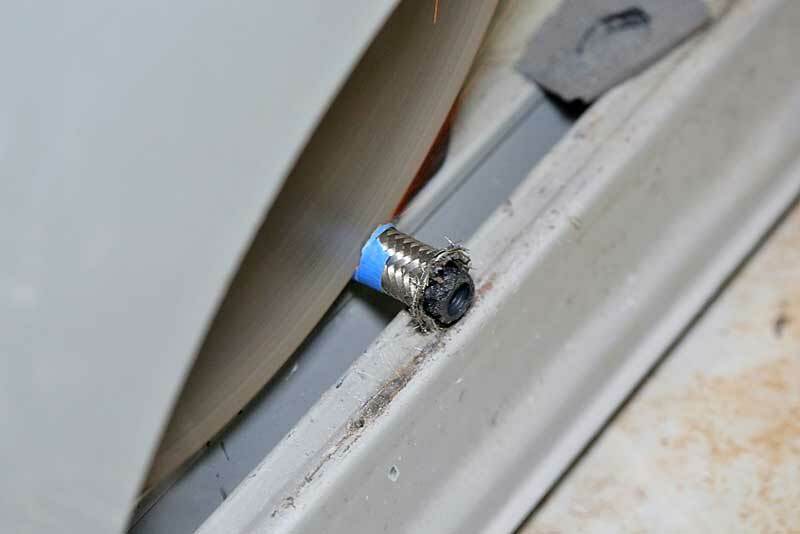 The pain of dealing with these things is worth it, especially when you need high-pressure lines that are durable. Nothing beats the abrasion resistance of a stainless steel braided hose. 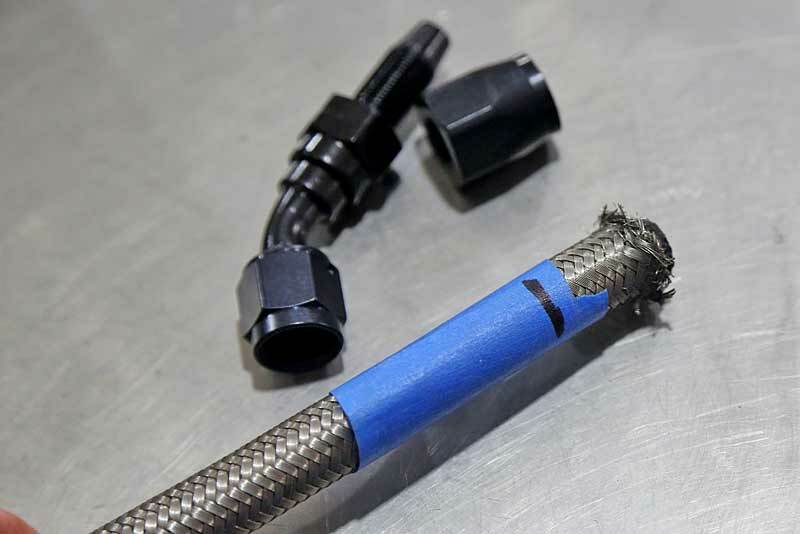 Working with braided hose can be a challenge, but it is one that you can certainly handle in your garage. 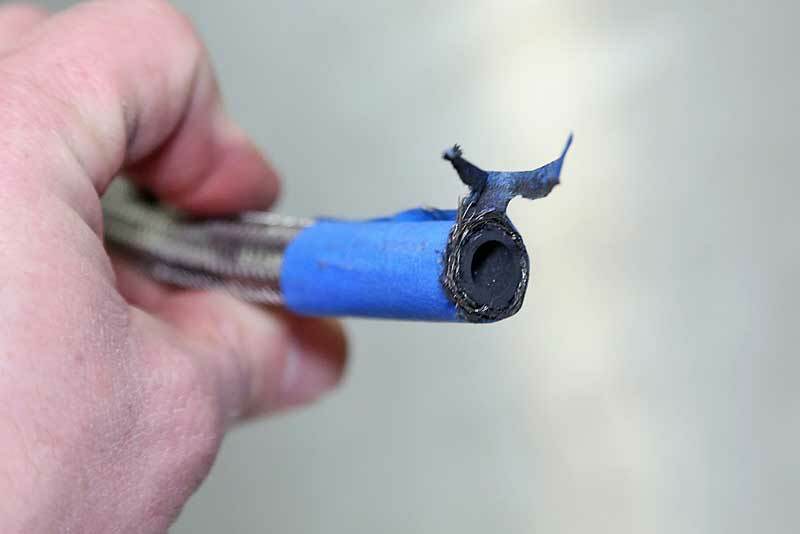 One area where beginners often make mistakes with braided hose is when cutting it. As soon as the braid starts to fray, it becomes nearly impossible to manage it, leaving you frustrated, and your fingers bloody. Not to mention the fact that getting the fittings onto a hose with frayed ends is simply not going to happen. Whatever you do, don’t use a hacksaw. That is the worst possible tool to cut braided hose. 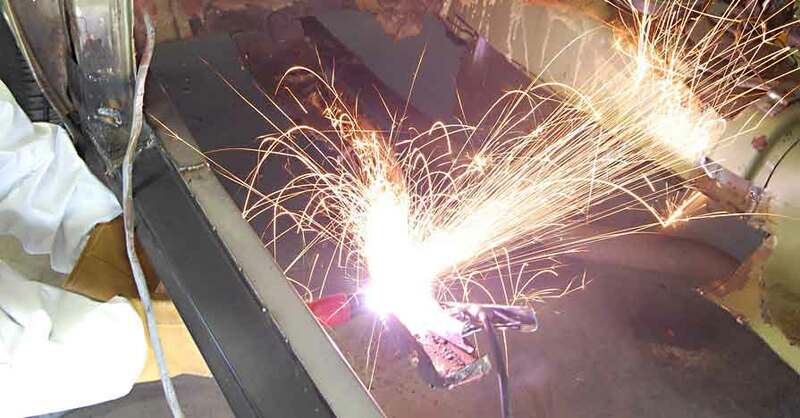 There are three tools that are acceptable for cutting this type of hose—chop saw, cut-off wheel, or a metal-cutting bandsaw. Before you cut the hose, you need to prep it. Using some electrical tape or masking tape, wrap a couple inches of the hose tightly. Then make your cut line on the tape. The tape will help keep the braid from fraying during the cutting and assembly process. 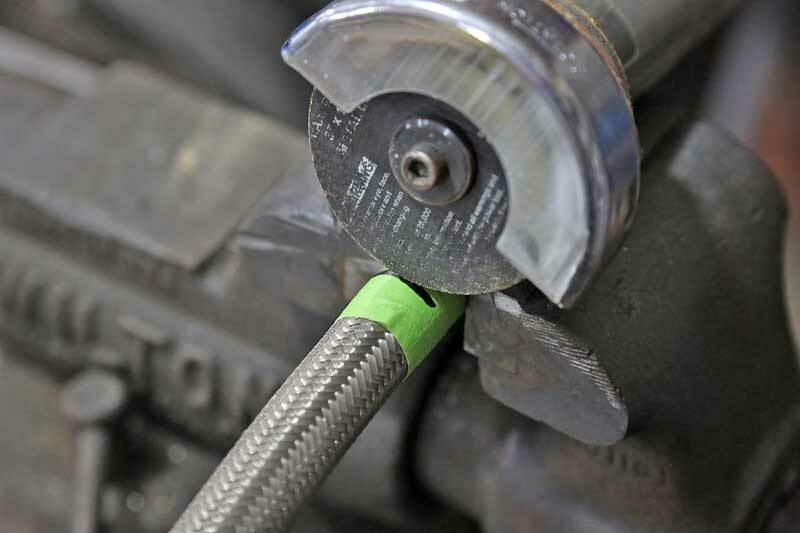 Wrapping the hose in tape helps keep the ends from fraying and gives you a clean place to mark your cut. The band saw option is not the best, but if you take your time, it can be done this way. You have to go really slow, and on the last section, as you are getting through the braid, slowly roll the hose into the saw blade so that you don’t get any frayed wires. 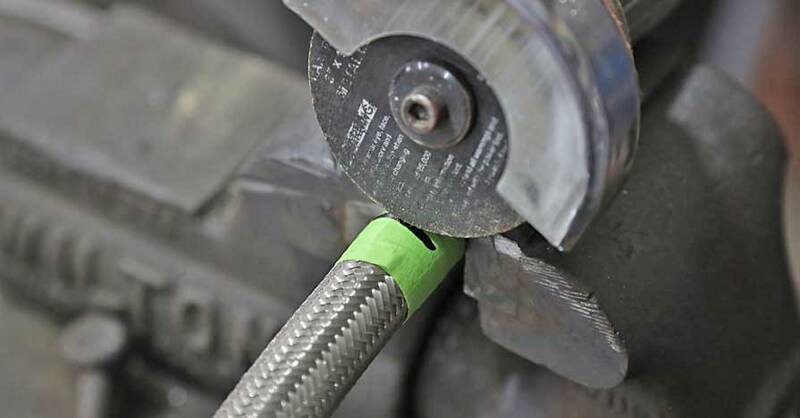 Cutting hoses with a cut-off wheel is a good way to get the job done without too much issue. You can hold the hose with one hand and cut with the other, but a vise is best so you will have better control over the cut-off wheel. Go slow, and take care not to put too much pressure on the hose, which can cause frays. 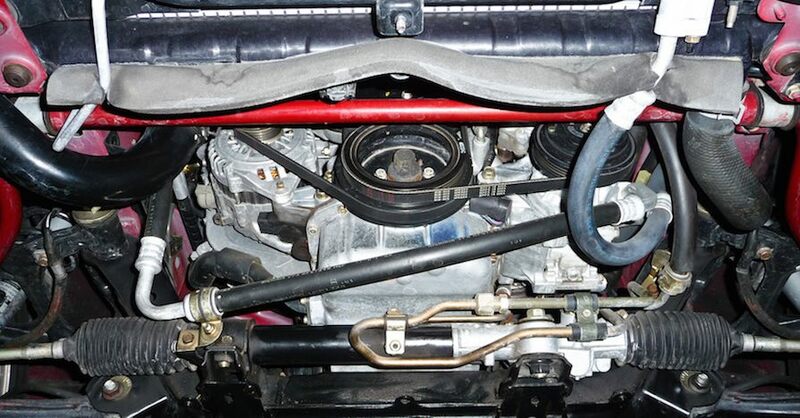 A cut-off wheel works well and you can cut hoses under the car is necessary. Just go slow and take your time to get a straight cut. The best tool to use is a chop saw with an abrasive wheel. You will get a good, clean cut without frays, and the chop saw has a built-in clamp, so you won’t have to worry about miss-cuts. A chop saw is best, it holds the hose in place, you have total control and you get a clean cut. This fraying happens a lot, so be careful not to cut too fast. You can trim these with wire cutters, but it is tricky. 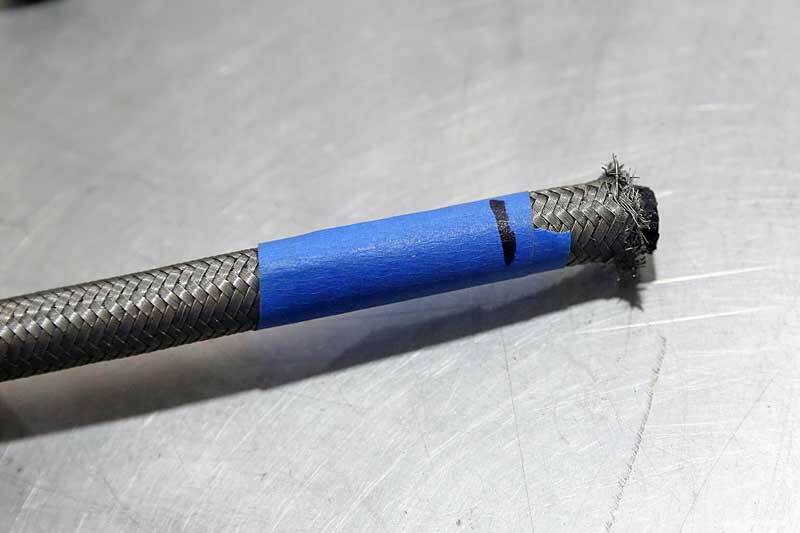 Once the hose is cut, put the remaining hose away, leaving the tape on the end. The piece you will use needs to be assembled, which we will be covering in a separate article. Don’t remove the tape just yet, as that will result in loosening the braid, which is a bad thing. Check out all the belts and hoses available on NAPA Online or trust one of our 16,000 NAPA AutoCare locations for routine maintenance and repairs. For more information on how to cut stainless steel braided hoses, chat with a knowledgeable expert at your local NAPA AUTO PARTS store.